By David SasonThree decades on and Depeche Mode remain an anomaly in the arena-rock world. What other electronic group could enjoy such consistent success and inspire devotion from millions of fans around the world? Armed with songwriter Martin Gore’s hypnotic electro-goth tunes, the pioneering U.K. trio’s “synthesizers-can-rock-too” spirit has best been proven by their celebrated live shows. Despite some canceled European dates (due to singer Dave Gahan’s gastroenteritis, bladder tumor and leg injury), the American leg of their Tour of the Universe actually began as planned last week, bringing them to the Bay Area on August 12. I caught up with founding bassist/keyboardist Andrew Fletcher (far left) to chat about touring, aging, deejaying, and survival amid the band's two big egos. D.S. : Thanks for doing this, Andrew. How are you? Andrew Fletcher: Good, thanks. We’re in New York at the moment, just having a couple of days break. We just started, three gigs over now, so it’s going pretty well. D.S. : It’s great that you guys are back up and running. It’s unusual for you guys to be sidelines. You guys are known as the road warriors. Andrew Fletcher: [Laughing] It sounds like a video game. [In fake trailer voice] “The Road Warriors”! D.S. : I trust Dave has recuperated now. Andrew Fletcher: It’s been pretty bizarre. The European tour has been one of the most successful tours we’ve ever done and the most calamitous as well, all in one go. But Dave has really got a competitive spirit in him. If anything, he thrives on these sorts of things. D.S. : The challenge, right. Does touring ever get too grueling? You guys have been going on three decades now. Andrew Fletcher: Well, we get treated pretty well these days [laughs]. You know, we get flown around, with nice hotels…but is it grueling? Well, I’m sure a lot of your readers have more grueling jobs than we do. Yeah, it’s tiring and not really nice being away from your family all the time. But it’s what we do, and we like it. We feel we’re still doing good shows, so it’s okay. D.S. : How have things changed since, say, Music for the Masses Tour? Surely the backstage scene must be completely different now. Andrew Fletcher: Of course your favorite stories and the real things you remember come back from those early days. We were very young, you know? All we had in our lives was Depeche Mode, and we made an album pretty much every year, we toured every year. And it was just a fantastic feeling, especially to break in America like we did, which was something completely unexpected for us, and one of the sort of nice things that’s happened in our career. But now, we’re domesticated; we’ve got families and stuff. And I think quite a lot of our fans are in that situation as well, so. It doesn’t mean you don’t love music; it’s just different, you know. Andrew Fletcher: –I don’t think our fans would say that we’re prolific [laughing]. Not now. D.S. : Well, you’ve kept busy, without, say, a five-year break in between records. Andrew Fletcher: No. We haven’t got anything planned for after the tour, but with the atmosphere at the moment being really good, I’m sure we are going to make another album & do another tour. We’re in a really good position. We sort of work for two years, then have a year off. It’s pretty cool. D.S. : People are loving Sounds of the Universe, and one of the descriptions coming up over and over again is “return to your roots”, and there have been tales of the vintage equipment you guys used. How did the recording differ from Playing the Angel? Andrew Fletcher: It didn’t differ very much from Playing the Angel because we were basically working with the same people, with a couple of changes. And we recorded it in pretty much in New York and Santa Barbara. But I think for some reason it seems to be a very easy record to make, and a lot of fun as well. I mean, the vintage equipment, for instance, that was good fun. Martin is buying up the whole world’s supply of vintage synthesizers and then turning up every day in the studio. It was fun. It was really fun, opening the box and getting a sound up. It was a bit like the old days, yeah, going back to the roots. Yeah, it was good. D.S. : But it happened organically, right? It wasn’t a conscious decision? Andrew Fletcher: No. I mean, no. We don’t really…we’re not sort of U2-like in that way. Nothing against U2, I think they’re a great band and we know them pretty well. But they seem to have a master plan, and we tend not to have much of a master plan, especially in the studio. D.S. : Exactly, in addition to being the makeshift manager. Andrew Fletcher: I was very much involved in the management during the first half of our career. We didn’t have a manager at that point, so that was the thing that I was quite interested in. But, like I said, I’m not the person in between the warring factions at the moment. I’m in the back, because there is no warring factions…touch wood…touching the desk here…and the atmosphere in the band is good, you know. I like being in the background. I think you can’t have a band when every single person in the band is going for the limelight. D.S. : Was that awkward, those few years when Dave went solo? At the time, did it seem like the end of Depeche Mode? Andrew Fletcher: Nope, it never was the end. It was important for Dave to do that because he’s always been a singer who doesn’t write the lyrics. Doing his own thing, I think, was very important because he’d talked about doing his own thing for years and he’d never ever done it. Really, if you look at it, the amount of stuff Depeche Mode has worked outside of Depeche Mode is not very much. Martin’s done two solo albums, Dave’s done two solo albums in 30 years, so it was never a…If Dave’s solo album was like a massive hit or something, and he said “bye bye, boys”, I don’t know. [laughs] But no, it was never like that. D.S. : I understand Dave & Martin wrote together for this album. Would you ever consider joining in the process? Andrew Fletcher: Not really, no. Actually they didn’t really write together. Martin did an instrumental and Dave separately put some words to it. So they didn’t actually write it together, and I really don’t have any interest in songwriting. I know I’m not a good songwriter, so I’m very lucky to be in a group with Vince Clarke, who’s a great songwriter, Martin, and now Dave’s writing some good songs. You know, not everyone, not every musician is a songwriter. And that might sound strange [laughs]. D.S. : No, I think it’s very refreshing, and you’re very humble because I’ve heard great things about your long-lost album Toast Hawaii. Andrew Fletcher: Yeah, before…I have to be careful, if I annoy him to much he’s going to put it out there. D.S. : Do you think it will ever get a proper release? Andrew Fletcher: No, no, it was done as a bit of fun when we were recording probably Black Celebration or something like that, in Berlin, and it’s just me covering rock n’ roll songs with the band playing various instruments. D.S. : How your Toast Hawaii record label going? Andrew Fletcher: The label’s not doing anything at the moment. Again, I can only really work with the label when I’m not working with Depeche, because the role of the label is to be full involved with an artist I take on. But when we had our last year off, I didn’t find anyone in that year really, and I ended up deejaying for a few months. So you never know. I have next year off, so if I find someone hopefully, the label will be back on. It’s not like a label that’s “on the go” all the time; it can just start up at any point, you know. D.S. : You brought up your deejaying, which is another reason you’re known as the member who’s always trying something new. You’ve been getting rave reviews for it. What is your style like? Andrew Fletcher: I use about 50% vinyl, 50% CDs at the moment. I don’t know what I’m going to do next, maybe a bit more computerized, I don’t know. But it’s been a normal setup. I try and play sort of a lot of music that I feel is suited around Depeche Mode, but I really play anything. I enjoy it, and I tend to go to places that Depeche Mode doesn’t go much, like Bucharest and places like that. D.S. : Have you ever been asked to guest-deejay at Popscene in SF? They sometimes have guest deejays and it seems right up your alley. Andrew Fletcher: No I don’t think so. Martin deejays as well, he’s our west coast DJ. He does Santa Barbara, L.A., and I’m sure he does San Francisco. D.S. : Are you still based in the U.K.? Andrew Fletcher: I’m based in the U.K., Martin lives in Santa Barbara, and Dave lives in New York, so we’re spread around. D.S. : Besides the deejaying, what do you do when you’re not working with Depeche Mode? Andrew Fletcher: On the year off? I just see my family basically. For two years I haven’t seen them that much. They’re probably happy with that actually. You know, just see my friends, go on holiday. Decent things I need doing, quite a few things to do. D.S. 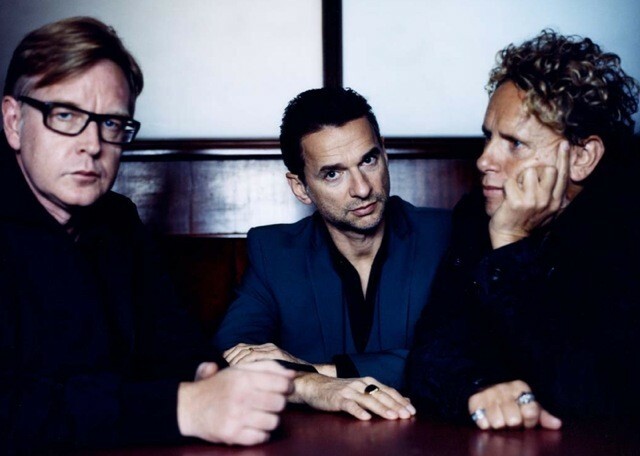 : Why do you think Depeche Mode has had such longevity while other bands – especially electronic bands – have fallen by the wayside? UPDATE: The show has been canceled; doctor's orders are for Dave Gahan's complete vocal rest for 48 hours. There will be no rescheduled Bay Area date this year. I guess Fletch wasn't bullshitting when he called the tour "calamitous". Full statement is here.